Background: Drought and salinity are two major abiotic stresses that severely limit barley production worldwide. Physiological and genetic complexity of these tolerance traits has significantly slowed the progress of developing stress-tolerant cultivars. Marker-assisted selection (MAS) may potentially overcome this problem. In the current research, seventy two double haploid (DH) lines from a cross between TX9425 (a Chinese landrace variety with superior drought and salinity tolerance) and a sensitive variety, Franklin were used to identify quantitative trait loci (QTL) for drought and salinity tolerance, based on a range of developmental and physiological traits. Results: Two QTL for drought tolerance (leaf wilting under drought stress) and one QTL for salinity tolerance (plant survival under salt stress) were identified from this population. The QTL on 2H for drought tolerance determined 42% of phenotypic variation, based on three independent experiments. This QTL was closely linked with a gene controlling ear emergency. The QTL on 5H for drought tolerance was less affected by agronomic traits and can be effectively used in breeding programs. A candidate gene for this QTL on 5H was identified based on the draft barley genome sequence. The QTL for proline accumulation, under both drought and salinity stresses, were located on different positions to those for drought and salinity tolerance, indicating no relationship with plant tolerance to either of these stresses. 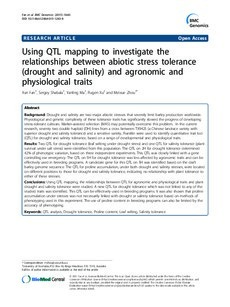 Conclusions: Using QTL mapping, the relationships between QTL for agronomic and physiological traits and plant drought and salinity tolerance were studied. A new QTL for drought tolerance which was not linked to any of the studied traits was identified. This QTL can be effectively used in breeding programs. It was also shown that proline accumulation under stresses was not necessarily linked with drought or salinity tolerance based on methods of phenotyping used in this experiment. The use of proline content in breeding programs can also be limited by the accuracy of phenotyping.